Sand artist Sudarsan Pattnaik created a unique sand sculpture on the shore of Puri beach in Odisha on the occasion of India’s 70th Independence Day. This sand art of Sudarsan Pattnaik is dedicated to Rio Olympians from India. 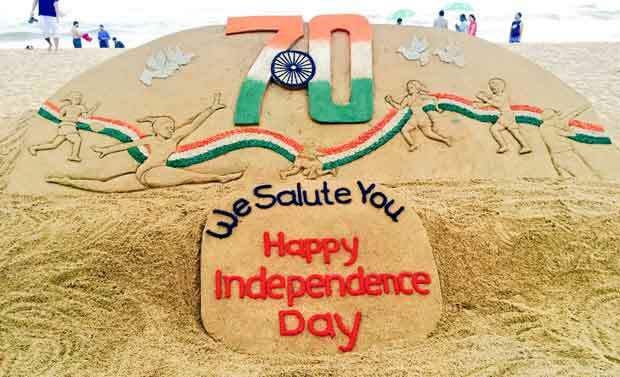 “My sand art on 70th Independence Day with message ‘We salute You, the Rio Olympians’ at Puri, Odisha,” Sudarsan tweeted. India achieved its Independence on August 15, 1947, ending more than 200 years of British rule. On this day holiday is observed throughout India with flag-hoisting ceremonies, parades and cultural events. Citizens of India celebrate the day by displaying the national flag on their attire, accessories and homes; by listening to patriotic songs, watching patriotic movies; and bonding with family and friends. Sudarsan Pattnaik’s sand sculptures include environmental crisis, famous festivals, national integrity and religious tolerance.